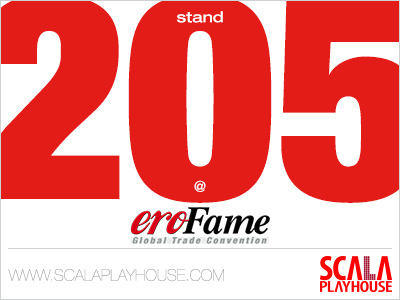 Scala Playhouse is ready to rock the eroFame 2015 on the 7th, 8th and 9th of October in Hannover, Germany. We are gearing up for another amazing edition and are bringing all our newest releases such as LUZ by TOYJOY. Visit us at booth 205 and profit from our special eroFame offers! For us eroFame is always a special event on the calendar; as we are one of its founding members. We wouldn’t dream of missing it! Every edition is a joy to attend and the atmosphere is always fun and inspiring. We are therefore pulling out all the stops; presenting our latest releases in an amazing 182 square meter booth! At eroFame we will once again present our most popular in-house brands such as our various TOYJOY ranges, Mae B, Hidden Desire and KissMe. We’ve also got plenty of new releases, such as our amazing collections: The Rabbits by TOYJOY and LUZ by TOYJOY. In The Rabbits by TOYJOY we’ve made a special selection of our most thrilling rabbit-style vibes and added some new favorites that will have your consumers hopping with pleasure. LUZ by TOYJOY is an innovative, must-have collection with unique LED ambiance light details; it seduces lovers to set the mood for some intimate fun in the dark! You can discover both these new collections at our booth number 205! During the event we will boast various attractive offers, which you simply have to see to believe. We can’t reveal all the details yet, but, we can state that these offers are simply too good to refuse! The offers will only be valid during the eroFame itself, so we encourage everyone to stop by our booth and get informed about the best deals. Besides must-have releases, amazing offers and new POS-options, we also have a special bar and musical entertainment in our stand. We want to create an atmosphere where our customers feel completely at ease, and can relax while getting informed by our skilled sales team. Be sure to stop by our booth to learn about our spectacular eroFame offers and to enjoy our hospitality, music and delicious drinks! We hope to see you there!